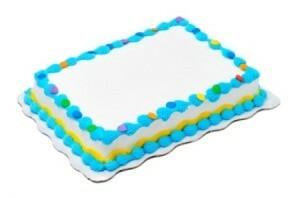 Sheet cakes are easier to make than layer cakes and travel easily for parties and potluck dinners. This page contains sheet cake recipes. Mix and set aside flour, sugar and soda. Bring to a boil in saucepan; cocoa, margarine, water and oil, stirring constantly. Add to flour mixture. Pour vinegar into milk and wait until it starts to curdle. Add to batter. Add eggs and vanilla and beat. Batter will be runny. Pour on greased cookie sheet. Bake 20 minutes at 375 degrees F.
For Frosting: Bring to a boil: cocoa, margarine and milk. Remove. Add vanilla and powdered sugar. Huge sheet cake for $10 home-made! Prepare the batter as the box directions (add 1 Tbsp. mayonnaise to each batter batch for moister result). Cook as directions, but it ends up being about 45 minutes. Be sure to turn down the heat at the end to about 300 degrees F. to allow the middle of the cake to finish cooking without the edges drying out. Serve it in the pan. It's not as deluxe as the store bought cake, but it's about $10 for this cake vs. about $200 for a bakery cake, and it tastes better. Combine 1 stick margarine, 1/4 cup cocoa, 1 cup water and oil in saucepan. Boil for 1 minute. Mix flour, sugar and soda together in large bowl. Pour cocoa mixture over dry ingredients, mixing well. Add 1 teaspoon vanilla, 1/2 cup butter milk and eggs, mixing well. Pour into large greased baking pan. Bake at 400 degrees F for 20 minutes. Combine remaining 1 stick margarine, 1/4 cup cocoa and 1/3 cup buttermilk in large saucepan. Bring mixture to a boil. add confectioners' sugar, salt, 1/2 teaspoon vanilla and nuts, mixing well. Frost cake and cut into squares. I am looking for a recipe for an extra large sheet cake (using box cake mix). I'm planning a large graduation party for my son. I have a large foil pan. It's called "full size" and measures 20x12 inches. I want to make the cake with box mix. Will this work? How many boxes of cake mix will I need? Also, they have a shallow pan and deep pan, so should I use the shallow pan? You will need 2 cake mixes, for the bigger pan. Either pan will work fine, as craftyme said just use two cake mixes for the large pan and one for the smaller one. If you use a recipe instead of a box mix use one of your recipe for the same amount as one box mix. Anytime I use cake mixes and am going to decorate them I freeze the cake before freezing even if I am not going to remove the cake to decorate, I think it adds moisture to the cake. Also if I am using a less expensive cake mix I add one package of instant pudding to each cake mix, really adds some flavor and moisture, also add an extra teaspoon of vanilla or other extract of choice. 1 yellow cake mix -Mix as directed on box and bake on cookie pan with sides at least 1" deep (18x12x1) or ( 17x11x2) Do not use a smaller pan. Bake @ 350 for 20 to 25 min. Cool in pan completely. Different cake mixes & different puddings & different fruit toppings can be used. Need to know your pans, sizes and best uses, also kind of metal they are made of. www.baking911.com is the perfect website to help you. Quality of cake mixes I find diminishing, so I plan for 1 1/2 boxes per 9x13x2or3 cake recipe needed. The other half of the cake the kids get to eat (put in another pan/dish). I also add 1 tsp per cake mix box of FRESH BAKING POWDER for the best moist, fluffy structured cake. If you are planning lots of frosting or decorating, then you need a heavier structured cake, those with puddings in or pound cake consistency. I use mostly Air Bake Pans. Go to the website listed above and any question you have will be answered. Just know what kind of ingredients will be used, as taller pans and lighter cakes go together. Pound or pudding cakes need a bigger base as not to be all gluey/sticky and easier not to have raw spots. Above all, ask your son for color and flavor. My grandchildren's favorite is 1 bowl of choco and 1 bowl of white with added orange food color, orange flavoring. Using smaller 8x8, 9x9 pans, pour a little of the chocolate in and spread around. Pour orange in the center, let spread out on its own. The chocolate swells and bakes around the orange. Who doesn't like the flavor of blood-orange chocolate candy? Tastes just like it! Can do this with variety of flavors and colors. Make Easter basket cakes a breeze! All 1 container contained. Frost with your favorite cooked/whipped fluffy frosting and decorate. As a cake decorator, I go by this rule: 9x13, one mix; 12x15, 2 mixes; 12x18, 3 mixes. Each pan is approx. 2 inches deep. I would feel confident using 3 mixes in your 12x20 pan; probably your shallow pan would measure around 2 inches. That should be just fine. You might want to consider renting the cake pan from a cake/candy shop. The foil pan is going to have to be re-enforced, unless you don't plan on taking it out of the pan to ice the entire cake. Another thing to consider is the size of your oven. I have a Wilton 20 x 12 pan and my oven is too small for the pan. There is not enough airflow for the pan, and my cakes burn. My Wilton pan takes 3 boxed mixes. You could also use a 9 x 13 pan that it extra deep, it will take 2 boxed mixes, bake 2 separate cakes, different flavors if you want, and place them side by side and ice as one cake. Good Luck! I would like a recipe to fill only one 10 inch pan for an upside down cake in either yellow or white flavor. Also do you have some good recipes for half-sheet size cakes?